Chicagoland Internet Service Providers range depending on the area code of where you need service. It will also depend on the speed needed and if satellite or hard line is a requirement. There are many new ISP’s being introduced to Chicago with their services and this article will cover all of them as of recent. So, once you move into your new apartment, condo, or house in Chicago, take a look at your options around your area before making a call to just ATT or Xfinity/Comcast. Cable Internet: copper, high speed Internet integrated with TV services. Fiber Internet: fiber optics, currently fastest residential available Internet. For home use, you do not receive a copper hand off traditionally, but typically a copper handoff. RCN has a solid foundation in Chicago. It’s probably the cheapest service available to Chicagoans. RCN is offering the fastest service available to Chicago home users right now at 155 Mbps at an affordable introductory rate of $44.99 a month. RCN doesn’t serve all of Chicago and seems to be typically offered in “nicer” areas of Chicago. Reliability and support seem to always be issues with this company. The equipment RCN leases to residents to use its Internet service is mediocre at best. There is little to offer in terms of custom options for setting advanced Wireless settings. In some stories, RCN doesn’t offer customers the option to purchase their own equipment to use for Internet – forcing to lease an Internet gateway from them. It is important to check the Bring Your Own Modem guide before making an outright purchase on equipment. In summary, RCN is the fastest and most affordable Internet available for home users in certain areas of Chicago. Since RCN is continually expanding its coverage and now offering this attractive offer, we bet RCN will continue to improve on it’s overall business and helping to better server Chicagoans in the next decade. WOW covers only certain areas of Chicagoland, so it is best to give them a call before considering them – 866-496-9669. This company offers a 60-day money back guarantee – that is 2 months. Customers seems to report that canceling within that time frame (if decided) has been hassle free. Technical support seems to middle-off with this company. Some report of not being able to get through during outages (which is typical of most ISP’s when there is an area outage) Their online troubleshooting documentation seems somewhat irrelevant to common problems; however, anyone always prefers speaking over the phone to someone when in a “total outage” scenario. WOW can only be ordered by phone – still. Probably the most common Internet Service in Chicago, AT&T is one of the oldest ISP’s serving Chicagoland. AT&T guarantees their prices for Internet tiers won’t change, and this has been validated by their customers. ATT allows you to create your own bundled services online as well. For Internet, you can choose between DSL or U-Verse. AT&T DSL uses the traditional phone service line inside of your home. In order to use DSL, you cannot have another telephone service activated inside your home. DSL runs over your home telephone lines and only one provider can run through these lines at once. ATT DSL is becoming obsolete but is still offered to areas where U-Verse isn’t available. If your looking for dual internet connections inside your home, the best option for you is DSL (Internet over Analog lines inside your house) and Cable (Cable either existing or extended into your house) service from an appropriate provider. Otherwise, you will need to consider business Internet options which are beyond the scope of this guide. There is also satellite Internet which doesn’t require land lines. AT&T provides you a router with a battery backup installed by default. If power goes out to your home, Internet still works as long as your router can receive an Internet signal from your provider. AT&T is probably one of the most reliable ISP’s in Illinois – with outages sparse to none. AT&T’s fastest U-Verse service still is far slower than other ISP’s. The trade-off might be reliability, but AT&T is expected to boost these speeds soon if they want to be valuable contenders in high-speed internet for Chicago homes. Cons: Highest speed tier is slow, very slow upload speeds for those trying to host, relatively expensive. This company offers some of the fastest DSL services available. They offer a unique package – a 5-year price lock. This package locks you into an Internet rate that is guaranteed to never change in 5 years. This is an awesome opportunity for home owners compared to renters. Since the service is DSL, upload speeds are relatively slow with the highest tier Internet capping at 5Mbps. Pros: Fast, cheap, reliable internet. Cons: very limited service in Chicago. Check coverage map. Fees: $99 install one-time fee, equipment lease fees $8 - $10. Early term fees. Xfinity (formally Comcast) is simply the fastest Home Internet Service Provider covering all of Illinois. Comcast sells services as bundled packages. These packages are the best deal when shopping for multiple services (phone, internet, TV). If needing only one service, you may end up paying more versus a bundled service. The purpose of this is so Xfinity can leverage their lay claim to providing all your house digital services. In either case, you will save $ going a bundled service. We love that Xfinity Internet comes close to matching upload and download speeds. This is important for a few reasons. Today, the Internet doesn’t require homes to have fast upload, but for multiple household devices connecting to the Internet, upload speeds may start to slow down if you have a slower upload speed. It won’t matter how fast your download speeds are when this happens. Buy, buy all your equipment when you can. Comcast will automatically provide you a leased modem and or a router. The lease fee for these can be as much as $10 a month. If you’ve lived with leasing from Xfinity for more than 5 years, that is $600. You can buy a router for less than $50 for Xfinity services – and you should definitely do this! Xfinifty serves a lot of area in Illinois and nearly all of Chicago. Reported Internet outage seems to come and go with Xfinity Internet service and there are reports of Internet outages but not admitted by Xfinity. In order to receive a rebate for an outage, you must call Xfinity to report it. Even though credit is insignificant by Xfinity, it will help you build a record of outages to have negotiating power in the future. Pros: Fastest internet in Chicago. Bundled packages are reasonably priced. Cons: Phone support is atrocious. Frequently disconnected from phone support and while on with support. Lease fees can be absurd. DirectTV is a satellite service available to everyone in the US Nation. Satellite service will never be as fast as land line service because for Satellite, the signal must travel from house to space then from space back to earth – and repeat, before you receive your Internet. In theory, you don’t notice a major difference; however overall download speed with satellite is severely limited and upload speeds are nearly non-existent. In theory, if you have land-line Internet access available to you should not consider satellite Internet. Cons: Internet service is extremely slow. Avoid Satellite internet if you have land-line access available to your home. Frontier seems to have a small Chicagoland market share. It is advertised as being available in Chicago, but we are unsure of specific zip codes service runs. We are also unsure of their speed tiers of Internet available in Chicago with Frontier. In review online, many customers seem to complain about advertised speeds they are receiver, although these reports seem to be in more rural areas for satellite service. Currently, Windstream offers Internet residential plans from 3 Mbps to 25 Mbps. Windstream serves Chicagoland residential, but currently is limited in different areas. Windstream internet service is reported reliable in business and residential service. 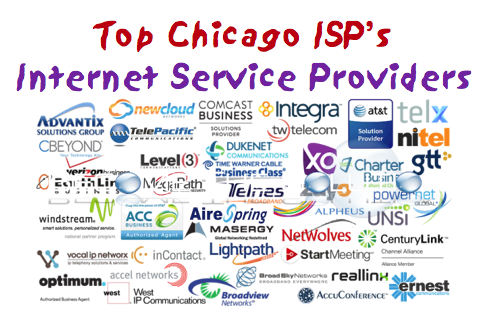 Please let us know of new Internet Service Providers in Chicago to share and for review. We will be happy to publish a review if you like.